- who they are, what they do and whether they can help you. plus links to more information. plus books written by the art business consultants listed below. I do not provide any recommendations about artist agents. I do NOT respond to any requests for recommendations. I also do not need your help with my activities. An art agent acts as "a middle man" between the artist/illustrator and the client/end user. Art agents work for a fee. They are used by corporate business or private clients to find the best artist for the job (or the collection). They avoid clients having to deal direct with artists and they make business requirements clear for artists. artists who will be dependable and high quality and can deliver what the client wants / needs on time and within budget. Assignments may be a one-off exercise. Or they could be part of a longer term engagement for a client. What they do, how they work and what they cost will vary according to the background, expertise and client base. They usually charge a fee. They may make this percentage based. An art business consultant helps artists to develop skills sets for marketing art and running their own art business. They charge fees based on hours/sessions or packages for mentoring or educational courses. ​This is the condensed version of how to succeed in the art business written by Alison Branagan, an author, business adviser and visual arts consultant who has devised and delivered courses on the art business for art students at the University of the Arts in London. An art agent is more usually associated with commercial art - like illustration. Agents tend to specialise by subject matter and geography. Competition to be represented by the best agents is intense. Your reputation as well as your artwork is critical. People who derive regular income from illustration usually have an agent who sends them work or puts them forward for work required by clients. Art agents get paid in different ways. CHECK LIST: Are you ready for an agent? Are you experienced in commissions? Do you have a consistent style? Does your artist statement say clearly what you do and how you work? Do you have an online portfolio which represents you and your work well? Can you work to a brief provided by a client? Do you have experience in interpreting a brief? Can you respond promptly to a brief? Can you produce artwork to a deadline? Do you uphold professional standards and ethics? Do you care about your own reputation and those of people you do business with? Would you prefer somebody else to handle the business / financial end of transactions with those asking you to produce artwork? How to Get an Illustration Rep | Business of Illustration - ways your work can stand out from the crowd. Art agents for fine artists represent the artwork of an artist and aim to both enhance its value as well as sell it. 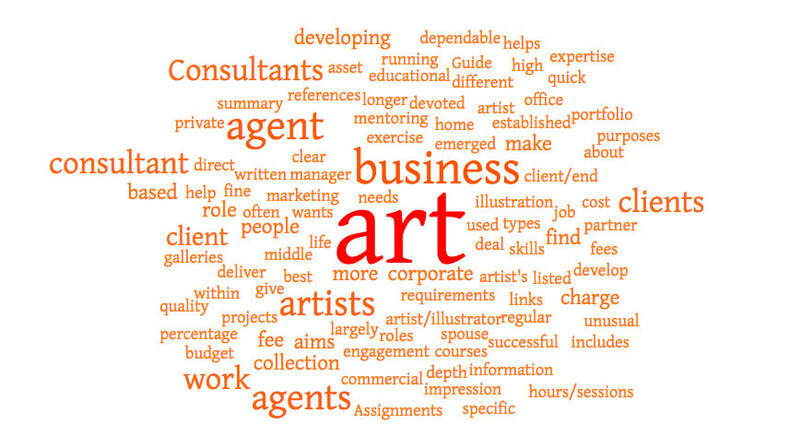 There is a major myth about art agents. A lot of artists seem to believe that they are the magic answer for artists wanting to sell their work. However the fine art world does not operate in the same way as the commercial art world where agents play a legitimate role in the absence of galleries to display the work of their illustrators. There are VERY FEW ART AGENTS FOR FINE ARTISTS. Those who do work as agents tend to work as (and are better known as) gallery owners or art dealers. Artists who do have personal agents tend to be very busy and extremely successful artists where the agent functions more in a business manager role. In theory an art agent finds a market for the art and enhances its value - for the benefit of both the artist and the agent. To this end they should focus on ensuring that artwork is positioned well - with the 'right' art collector and/or in the 'right' museum. Commission rates charged by fine art agents without a gallery should be less than those charged by a gallery since they are not financing the fixed cost overheads associated with displaying art and holding exhibitions in premises. they may be using pop-up galleries for one-off shows to display the work of artists. Thus the real value of an agent - if they exist - is who they can introduce your art to without using a gallery. Otherwise you are paying a fee for an agent to get your work sold and then on top of that paying commission to a gallery when they sell your artwork. How much will be left for you - after you have paid your expenses and taxes? NEVER pay any money to an art agent up front. Beware of people whose business is to relieve you of your money rather than sell your art. Are you making enough money from your art to share the proceeds via commission to an art agent as well as a gallery? find out how long they have been working in the art market - and who they have worked for. Watch out for those that embellish their experience. Listen to the questions they ask - and don't ask. Do they own a venue? Are they looking for stock? In which venues / galleries have they placed artists? Ask them how they work - how do they promote artists; what strategies do they use? Choosing An Artist’s Representative By Renée Phillips | Professional Art Magazine - When choosing an artist representative, do your homework to make sure you know enough about them and how the business relationship will work. Renee Phillips poses 16 questions to ask to get the whole story. Artists, do you need an Agent | Artsy Shark - Carolyn Edlund exposes the myth of what an art agent can do for you. Common Sense Rules for Finding an Art Agent - how does an artist find a legitimate agent/broker to represent our work? These are a few of my rules after thirty years. An Art Consultant is somebody who procures art - or helps to buy art - on behalf of a client who may be a collector or a corporate entity. A few of them act as investment advisers for those wanting to use the art market to make money or safeguard capital. Those who purport to be art consultants can vary from the well qualified and very experienced to charlatans who only care about maximising their fees. Getting your art into Corporate Art Collections by Renée Phillips - find out what the corporate criteria is, how corporations purchase art, how to make contact, and more. Probably most relevant to those living in the UK but lots of content is relevant to aspiring artists and those starting out everywhere - and probably quite a few who have been around for a longtime who could benefit from these art business basics. An essential book for any artist/designer who is thinking of setting up their own business, this book literally covers everything you need. This is the information that should be taught in art schools and isn't! This section will focus on the latter. The following are the people are art business consultants I am aware of who have been around for a while and have developed a following. I'm not making any recommendations here and the list is alphabetical (based on the name of the lead practitioner). Their location is indicated after their name. A link to their website is embedded in the name of those art business consultants listed below. Alison Branagan (UK) - author of a number of books about the art business. Offers a range of courses and workshops and other services. Sets up courses for and lectures at UK Universities. Cory Huff - The Abundant Artist a Web site not only about selling art, but about dispelling the starving artist myth. Lots of free articles, videos and podcasts. Written by Alyson B. Stanfield writer of ArtBiz Blog and a workshop leader, art-marketing consultant, and the founder of Art Biz Coach.